Shafiee-Tabar, M., Akbari-Chermahini, S. (2017). The Role of Mindfulness and Emotional Regulation in Predicting Depression and Anxiety in University Students. International Journal of Behavioral Sciences, 11(3), 101-106. Mahdiyeh Shafiee-Tabar; Soghra Akbari-Chermahini. "The Role of Mindfulness and Emotional Regulation in Predicting Depression and Anxiety in University Students". International Journal of Behavioral Sciences, 11, 3, 2017, 101-106. Shafiee-Tabar, M., Akbari-Chermahini, S. (2017). 'The Role of Mindfulness and Emotional Regulation in Predicting Depression and Anxiety in University Students', International Journal of Behavioral Sciences, 11(3), pp. 101-106. Shafiee-Tabar, M., Akbari-Chermahini, S. The Role of Mindfulness and Emotional Regulation in Predicting Depression and Anxiety in University Students. International Journal of Behavioral Sciences, 2017; 11(3): 101-106. AbstractIntroduction: The present study aimed to investigate the role of mindfulness and emotional regulation in predicting depression and anxiety in university students.Methods: The study uses a descriptive-correlative design. For this purpose, 373 students were selected through random cluster sampling from the Arak University (185 males and 188 females). They were asked to answer to the five facet mindfulness questionnaires, the emotional regulation scales, as well as the depression, anxiety and stress questionnaire. Then, the correlation and regression analyses were employed.Results: The results showed that re-evaluation, as one of the components of the emotional regulation and mindfulness, had a significant negative correlation with depression and anxiety. In addition, the suppression of other emotional regulation components had a significant positive correlation with depression and anxiety. The results of the regression analysis indicated that mindfulness and emotional regulation could predict depression and anxiety in the university students.Conclusion: In general, it is suggested that mindfulness and emotional regulation are important psychological factors in predicting depression and anxiety in university students. Baer RA, Smith GT, Allen KB. Assessment of mindfulness by self-report: The Kentucky Inventory of Mindfulness Skills. Assessment. 2004; 11(3), 191-206. Shapiro SL, Carlson LE, Astin JA, Freedman B. Mechanisms of mindfulness. Journal of Clinical Psychology. 2006; 62(3), 373â386. Verplanken B, Friborg O, Wang CE, Trafimow D, Woolf K. Mental habits: Metacognitive reflection on negative self-thinking. Journal of Personality and Social Psychology. 2007; 92(3), 526â541. Caldwell JG, Shaver PR. Mediators of the Link Between Adult Attachment and Mindfulness. 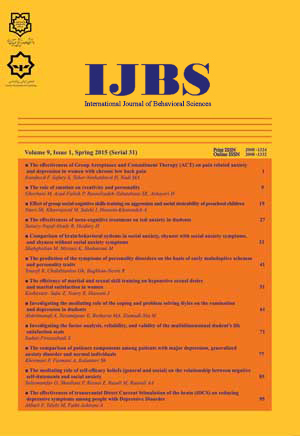 An International Journal on Personal Relationships. 2013; 7(2), 299â310. Barnhofer T, Duggan DS, Griffith JW. Dispositional mindfulness moderates the relation between neuroticism and depressive symptoms. Personality and Individual Differences. 2011; 51(8), 958â962. Greason PB, Cashwell CS. Mindfulness and counseling self-efficacy: The mediating role of attention and empathy. Counselor Education and Supervision. 2009; 49(1), 2â19. Frewen PA, Evans EM, Maraj N, Dozois DJA, Partridge K. Letting go: mindfulness and negative automatic thinking. Cognitive Therapy Research. 2008; 32, 758-774. Brown KW, Kasser T, Ryan RM, Alex Linley P, Orzech K. When what one has is enough: Mindfulness, financial desire discrepancy, and subjective well-being. Journal of Research in Personality. 2009; 43(5), 727â736. Howell AJ, Digdon NL, Buro K, Sheptycki AR. Relations among mindfulness, well-being, and sleep. Personality and Individual Differences. 2008; 45(8), 773â777. Schutte NS, Malouff JM. Emotional intelligence mediates the relationship between mindfulness and subjective well-being. Personality and Individual Differences. 2011; 50(7), 1116â1119. Cash M, Whittingham K. What facets of mindfulness contribute to psychological well-being and depressive, anxious, and stress-related symptomatology? Mindfulness. 2010; 1, 177â182. Brown KW, Ryan RM. The benefits of being present: Mindfulness and its role in psychological well-being. Journal of Personality and Social Psychology. 2003; 84(4), 822â848. Brown KW, Ryan RM, Creswell JD. Mindfulness: Theoretical foundations and evidence for its salutary effects. Psychological Inquiry. 2007; 18, 211â237. Marlatt GA. Buddhist philosophy and the treatment of addictive behavior. Cognitive and Behavioral Practice. 2002; 9, 44â50. Shapiro SL, Oman D, Thoresen CE, Plante TG, Flinders T. Cultivating Mindfulness: Effects on Well-Being. Journal of Clinical Psychology. 2008; 64, 840-862. Breslin F, Zack M, McMain S. An information processing analysis of mindfulness: Implications for relapse prevention in the treatment of substance abuse. Clinical psychology: Science and Practice. 2002; 9, 275-299. Coffey K, Hartman M, Fredrickson B. Deconstructing mindfulness and constructing mental health: Understanding mindfulness and its mechanisms of action. Mindfulness. 2010; 1(4), 235â253. Wang Y, Kong F. The role of emotional intelligence in the impact of mindfulness on life satisfaction and mental distress. Social Indicators Research. 2014; 116:843-852. Segal ZV, Williams JM, Teasdale JD. Mindfulness-based cognitive therapy for depression: A new approach to preventing relapse. New York: Guilford. 2002. Hayes SC, Stosahl K, Wilson KG. Acceptance and commitment therapy. New York: Guilford Press. 1999. Gratz KL, Tull MT. Emotion regulation as a mechanism of change in acceptance- and mindfulness-based treatments. In R. Baer (Ed. ), Assessing mindfulness and acceptance processes in clients: Illuminating the theory and process of change. Oakland, CA: New Harbinger Publications. 2010. Gross JJ. Emotion regulation in adulthood: Timing is everything. Current Directions in Psychological Science. 2001;10: 209-214. Gross JJ. The emerging field of emotion regulation: An integrative review. Review of General Psychology. 1998; 2: 271-299. Gross JJ, John OP. Individual difference in two emotion regulation processes: Implications for affect, relationships, and well-being. Journal of Personality and Social Psychology. 2003; 85: 348- 362. Werner K, Gross JJ. Emotion regulation and psychopathology. In A. Kring & D. Sloan (Eds. ), Emotion regulation and psychopathology (pp. 13â37). New York: Guilford Press. 2010. Joormann J, Gotlib IH. Emotion regulation in depression: relation to cognitive inhibition. Cognition and Emotion. 2010; 24, 281â298. Dunn BD, Billotti D, Murphy V, Dalgleish T. The consequences of effortful emotion regulation when processing distressing material: a comparison of suppression and acceptance. Behavior Research and Therapy. 2009; 47, 761â773. Amstadter A. Emotion regulation and anxiety disorders. Journal of Anxiety Disorders.2008. 22, 211â221. Mauss IB, Cook CL, Cheng JYJ, Gross JJ. Individual differences in cognitive reappraisal: experiential and physiological response to an anger provocation. International Journal of Psychopathology. 2007; 66, 116-124. Szasz PL, Szentagotai A, Hofmann SG. The effect of emotion regulation strategies on anger. Behavior Research Therapy. 2011; 49(2):114-119. Kashdan TB, Barrios V, Forsyth JP, Steger MF. Experiential avoidance as a generalized psychological vulnerability: Comparisons with coping and emotion regulation strategies. Behavior Research & Therapy. 2006; 44:1301â1320. Aldao A, Nolen-Hoeksema S, Schweizer S. Emotion regulation strategies across psychopathology: A meta-analysis. Clinical Psychology Review. 2010; 30(2), 217â237. Balzarotti S, John OP, Gross JJ. An Italian Adaptation of the Emotion Regulation Questionnaire. European Journal of Psychological Assessment. 2010; 26 (1): 61-67. Henry J, Crawford JR. The short-form version of the Depression Anxiety stress scales (DASS-21). The British Journal of clinical psychology. 2005; 44, 227-239. Baer RA, Smith GT, Hopkins J, Krietemeyer J, Toney L. Using Self-report Assessment Methods to Explore Facets of Mindfulness, Assessment. 2006; 13 (1), 27-45. Neuser NJ. "Examining The Factors of mindfulness: A confirmatory Factor Analysis of the Five Facet mindfulness Questionnaire", School of professional psychology. 2010. This dissertation is available at CommonKnowledge: http://commons.pacificu.edu/spp/128. Ahmadvand Z. Checking the validity and reliability of the five-sided mindfulness questionnaire in Iranian non-clinical samples, clinical master thesis, Shahed University. 2011. Teachman BA, Joormann J, Steinman SA, Gotlib IH. Automaticity in anxiety disorders and major depressive disorder. Clinical Psychology Review. 2012; 32:575â603. Evans DR, Segerstrom SC. Why do mindfull people worry less? Cognitive Therapy Research. 2010; 35:505-510. Miller EK, Cohen JD. An integrative theory of prefrontal cortex function. Annual Review of Neuroscience. 2001; 24, 67-202. Barcelo F, Suwazono S, Knight RT. Prefrontal modulation of visual processing in humans. Nature Neuroscience. 2000; 3, 399-403.